The view from Sheriff's Mountain. In early 1972, the BBC and MoD had a serious disagreement over a contract for the joint use of an installation there. The Sentinel has obtained documents from the National Archives in Kew showing how lawyers for the BBC and Army were locked in a legal dispute over shared use of the Sheriff’s Mountain transmitting station during the worst year of the Troubles. Several letters were exchanged between the Treasury Solicitor’s office - representing the Ministry of Defence (MoD) - and the state broadcaster’s legal representatives in an attempt to resolve the dispute, which centred on whether English or Irish law should apply and who would pay if the Provos blew the mast up. 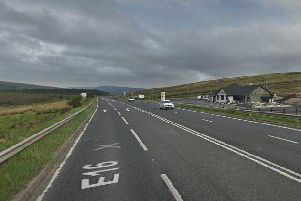 The BBC were locked in a legal dispute with the MoD over Sheriff's Mountain. The concerns over a potential attack were founded on the fact that such installations had been targeted by republicans in the past. Of five people killed by the IRA near a transmitter on Brougher Mountain in Tyrone in February 1971, for example, two were BBC engineers. By the time of the dispute the Army had been jointly occupying the site, overlooking Londonderry from its vantage point behind Creggan, from December 1969. Disturbances in the Bogside after the Relief of Derry parade in 1969. The Army were deployed here in the aftermath. This was shortly after the Army had been deployed here in the wake of serious civil disturbances following the Relief of Derry parade in August of that year. But by early 1972 - a year marked by Bloody Sunday, the collapse of the old Stormont administration and the largest number of deaths of any year of the Troubles - the BBC and MoD’s lawyers were locked in conflict over the terms of the licence for use of the site. The MoD were concerned that if the Irish Republican Army (IRA) blew up the transmitter, it would be left to pay the bill. A document held amongst the Treasury Solicitor’s office files from early January 1972, the contents of which are revealed here for the first time, discussed the implications of the BBC position. It argued that one of the clauses of the contract needed to be changed to make sure that the MoD would only be liable for damage to the Sheriff’s Mountain installation, if the damage was caused by the Army. The MoD asked the Treasury Solicitor’s to intervene on its behalf. “Will you please attempt to restrict it to the Department being responsible for the repair of damage caused by the MoD?” the note stated. “We make this request because in other cases we have been advised by our Northern Ireland Solicitors that where property occupied by the MoD is damaged by the IRA the landlord should claim compensation from the Government of Northern Ireland under the Criminal Injuries Act (NI) 1956/1970,” it added. The MoD were also confused by the BBC’s claim that English rather than Northern Irish law should apply to the installation at Sheriff’s Road. Although the Treasury told the MoD, in no uncertain terms, that the matter should be dealt with by Finance Minister Herbert Kirk’s people in Belfast, the office ultimately did reply to the BBC on the MoD’s behalf. The letter reads: “In any case, I feel that it is not for a Government to by-pass what has been decided by Parliament. “If the installation were on Scottish soil instead of in Northern Ireland, you would surely not suggest that Scottish Law should not apply?” the Treasury Solicitor asked. Needless to say, the BBC’s learned representatives strongly disagreed and responded in tetchy kind. On March 8, they wrote to argue that because the BBC and MoD were headquartered in England and employed solicitors headquartered in England, English law should apply to the licence contract. The BBC asked the Treasury to tell it what Northern Irish legislation was relevant. The broadcaster’s solicitor then also dropped the bombshell that the MoD had agreed that English law would apply to the contract at the Mount Divis transmitter in Belfast the year previously. On April 7, 1972, a chastened Treasury office confessed it wasn’t aware of the agreement reached concerning Divis. He wrote that he was thinking of such measures as the Criminal Injuries (NI) Acts 1956/1970 and the Criminal Injuries to Persons (Compensation) Act (NI) 1968 in connection with certain clauses in the contract. By this stage in the correspondence the BBC were able to refer to the fact that the “position in Northern Ireland had changed,” referring to the collapse of the old Stormont Government and the dissolution of Parliament in late March 1972. By April 28, 1972, the Treasury Solicitor’s office was dispatching an angry letter to the MoD for apparently coming to an agreement with the BBC, recognising the application of English law in the Divis case, without consulting it. It appears English law was to apply to Sheriff’s Mountain. The Principal Assistant wrote: “The confidence expressed in the third paragraph of my letter of April 7, to the BBC‘s Solicitor seems to have been misplaced and, as I said to him, I am indeed very surprised at what the Ministry have done. “The letter of April 6, 1971, from the BBC’s Solicitor to Mr Southey set out the terms on, which the corporation was prepared to allow the Ministry to continue its use of the Divis Transmitting Station and these were accepted with slight amendment but without mention of the acceptance being subject to contract. “The mere suggestion that the terms might later be incorporated in a formal agreement did not, in my opinion, prevent a contract from arising. Thus, judging from the legal correspondence the BBC won the legal battle of wits over the Sheriff’s Mountain installation, which, in terms of this joint use agreement at least, was subject to English law.